So, here are the MAC standings as of this morning. There is, obviously, a huge log-jam in the middle, with a four-way tie at 6-7 and Ball State just one game back. Kent is first in the 4-way tie due to a 3-1 record among the four teams and BG is second due to a 2-1 lead among the four teams. For Falcons fans, here are the pertinent questions. What does it look like if BG wins two coming home? At 8-8 with a win over Buffalo and Kent, it is hard to imagine that BG does not end up in 4th. They would have tiebreakers over all the competitive teams. If BG did beat Kent, they could have to beat Akron just go get to 8-8. EMU would have to beat WMU or UT (assuming a win @CMU) and Buffalo has to beat either Akron or OU and BG to get to 8. Ball State would have to win out to get to 8 and they still have to go @UT and @WMU. I don't see any of that happening, but I don't see us beating Kent either. It is a similar story if BG gets to 8 with a win over OU and Buffalo. If Kent wins @Miami and beats BG and loses to Akron, they would tie BG at 8-8. BG would have the tiebreaker due to its win over WMU. Beating OU will be no picnic, either. Now. What if BG only wins 1 coming home, and it is Buffalo. With BG at 7-9, Kent probably finishes 4th due to beating MI and BG and losing to Akron and going 8-8. However, under that scenario, Buffalo could easily be 6-10. If they end up in a tie with BG at 7-9, they would win the tiebreaker because their win over Akron over OU would be better than BG's win over WMU. Beyond that, it is hard to tell. EMU should get 1 win and be 7-9. In a head to head tie, however, BG would beat EMU due to head to head victory. In the end, with a win over Buffalo, I think BG has a good shot, but far from a lock at the #5 seed. With two wins, however improbable, I think BG has an excellent shot at being #4. There's lot to play for. There is no interplay on Saturday...all of our competitors can lose. Beyond BG winning, we need Miami, WMU, Akron, and Toledo to win, and there's a good chance we get 3 out of 4. It certainly wasn't a pretty effort out there last night, but it is the time of year when you are not looking for style points but rather for wins, and BG was playing a 11th place team in BG and it was a win you just have to be able to get, and they got it. For a long period of the game, that did not appear to be a slam dunk, if you will pardon the phrase. The game was tight most of the way. In fact, Miami led by 9 late in the first half and by 7 at halftime. The Falcons had to have been very nervous in that locker room. It obviously hasn't been a great season, but if you were to finish in the #4 slot (#5 in the league overall with Toledo included) you have at least salvaged something. And the Falcons delivered the victory they needed. First, they held Miami to 13 second half points. Even better, with 7:44 left, Miami led the game 44-42. From that point in, BG outscored them 12-2 to win by 8 points, 52-44. Everyone was critical of the defense Saturday in Fort Wayne, so you have to give credit in this game. They defended Miami very well. When you close a game out allowing one FG in 7:44 of play, that's solid basketball. They were helped by Miami having an awful night at the line. They were 1-8 in the second half at the line and missed 6 free throws in that last 7:44 run. BG didn't exactly have a stellar offensive night, at .88 points per possession. That's the 8th lowest average for any game this season and the second lowest winning average--BG beat EMU at .77 points per possession. Miami, for all that, scored only .75 points per possession, which is the fourth best total of the season and well below their average of .97. It was their second worst offensive game of the season and the worst was when they played Louisville. Add in that the game was very slow paced (59 possessions) and that's how you get the 1950s final score of 52-44. BG shot 40% from the field and 33% from beyond the arc, which is not great at all. However, Miami shot 33% and 17% plus 40% from the line. Ouch. Miami stayed in the game by having half as many turnovers as BG did. The Falcons dominated the offensive boards and had a +2 advantage in free throws and that was enough to get the win on this day. Jordon Crawford had 19 points on 7 of 15 shooting, a very nice night for him. Remember, the team only scored 52. He carried the team offensively through a lot of possessions where there was nothing going on. A'uston Calhoun had 9 points (4 of 7 shooting) and 8 rebounds in 28 minutes due to foul trouble. He also had 5 of BG's 14 turnovers. If you were watching to see if he was different after the IPFW benching, he looked the same to me. He did take a lot of jumpers, but that might have been in the game plan this time. Cam Black had 6 points and 9 rebounds and Chauncey Orr had 7 rebounds. Jehvon Clarke had 7 points as well and Craig Sealey had 5 rebounds in 12 minutes of play. Orr and Kraus struggled with the shot, a collective 2-11. And so it goes. BG, as it stands this morning, is #5 in the MAC and would head straight to the Q. The next two games are very tough--OU and @Kent. Each has hopeful elements--how does OU bounce back after a wrenching loss at home last night--and can BG win @Kent, who is not the normal Kent...but BG has yet to bring a big performance on the road. Anyway, everyone else has the same or similar problems. BG needs the kind of game it brought against Detroit or WMU and maybe they have a shot at OU Saturday. Who are we rooting for? Root for whoever you want, the result is not important to our prospects. In general, we want Akron to win the rest of their games, because they are playing teams we are contending with. And we want OU to win their last two...but for tonight, it isn't worth worrying about. WMU by a smidge. Doesn't really matter, however, BG's win over WMU could be big in a tie breaking scenario and therefore we need them to finish 3rd. CMU. Ball State is 1 game behind BG, 2 with the tie breaker. CMU is no threat to anyone but themselves. This is a tweener. BG is 1 game behind Buffalo but would probably beat Buffalo in the tiebreaker if BG beats Buffalo at the Stroh to end the season. Meanwhile, BG has to play @Kent...same deal though, we probably win a tie with them. I'm rooting for Buffalo, but this one could go either way. Go Huskies. Defend that home court. Just saw the feed from @rickcassano, the Red Hawk beat writer, and the road for Miami just got a little more difficult. Their 6'11" Junior Center Drew McGhee has a knee injury and will miss the rest of this season. McGhee averaged 5.2 points and 2.3 rebounds per game for Miami, shooting 56.6 percent from floor and 79.2 from line. Not huge numbers, but he did that in only 12 minutes a game, on average. He had 14 points and 5 rebounds in 22 minutes when the two teams played in Oxford. It does leave them small. Their tallest player getting regular minutes is Jon Harris at 6'8". The only assistant BG lost over the past year was Clark Lea who moved on to Syracuse after one season coaching the BGSU linebackers. Coach Clawson today announced a replacement...Robert Neviaser. Neviaser follows the general Clawson trend for hires, which means that he has a I-AA backgound in the East. For the last two seasons he was the defensive coordinator at Stony Brook, which has made the playoffs in that time and last year had the 4th ranked scoring defense in the nation. Before that, he had successful (based on his bio) stints at Rhode Island and Delaware. Anyway, I have said before that I am fine with getting successful I-AA guys. There is not a huge difference between I-AA and the MAC, and people at that level are used to being resourceful because you just don't have the money to do everything, like you might at, say Alabama. I think it is good training and I think BG has gotten good coaches using this method--starting with Coach Clawson and Mike Elko and continuing through what I believe is a strong staff.....or, if you prefer, a staff that is getting results. Welcome to the Falcons, Rob. There is no better way to put it. If BG has any hope of salvaging their season with a decent finish and #4 or #5 seed, this is a game they have to have. In fact, the Miami loss just looks disastrous on our schedule. They are 3-9 in MAC play and BG is the only team that went into Millett this year and came away with a loss. Since they beat BG, they have lost 9 of 10 and 8 or 9 in the MAC, beating only CMU, the worst team so far. They are 8-17 and 3-9. Their RPI is 269 and their kenpom is 250. Those numbers, actually, are only slightly behind BG's. Anyway, beyond the losing streak not much has changed since the last time BG played them. The main struggles for this team are on defense. They are 11th in the MAC in defensive efficiency. They are dead last in defending the shot, at 54.9% EFG%. They give up a fair number of offensive rebounds and are 8th in the MAC in allowing teams to get to the line. They are good at one thing, and that is forcing turnovers--they are 3rd in the MAC in that category. Offensively, they are in the middle of the pack. They are 8th in points per possession. They aren't bad with the shot--5th in the MAC--and they are 6th in turning the ball over. They are terrible on the offensive boards (11th) and 6th at getting to the line. We noted the last time we played that they are an anomaly in that normally a team's points per possession can easily be explained by the four factors, but in this case, Miami's output is worst than the sum of its parts. BTW, in the first game, BG allowed Miami to be way too efficient...they scored at 1.1 points per possession. Tomorrow's performance has got to be the BG defense we have seen in general, notwithstanding the effort Saturday. Individually, things were tough enough and then Bill Edwards was lost for the year. They are led by Allen Roberts, who is scoring 12.8 PPG on 39% shooting, which is a rough way to go. Will Felder is scoring 11 points per game on 51% shooting and leading the team with 5.4 rebounds as well. Quentin Rollins leads them with 4 assists and 2 steals per game. BG is coming of a difficult night in Ft. Wayne. (Miami lost by 1 to IPFW). There seemed to be strong emotions and BG's leading scorer was bench for the entire second half. The question will be how the team responds to that. Will BG bounce back or will there be a residual effect. There are four games left in the regular season, and BG has 3 at home. BG has been playing well at home and this is a team that is really struggling. We struggle on offense and they struggle on defense. This is a game you just have to win. So, Saturday the bracket buster came to an end. Its effects will be felt for a while--for example, Akron is going to have to go North Dakota and Toledo to McNeese State (lots of luck, I've been there and it is, um, interesting)--but beyond that, it was the kind of day you expect from the MAC. OK, but not great. The conference went 5-7. Here are the wins and losses, with kenpom ratings listed. Akron had the best win, though the game was at home. Ohio had a really tough assignment. They had the toughest opponent and on their floor. Kent has the best road win. NIU has the worst loss...worst opponent and then game was in DeKalb. UT has the easiest win. EMU had the worst home less. First, I don't think the Bracket Buster changed much for the MAC. I think Akron could easily be a Sweet 16 team but I don't think they are anywhere near an at-large bid. And, their game was good but not good enough to make a real difference. I almost think you want to go on the road for the Bracket Buster--a home win just doesn't get the steam you need. Even after the game, Akron's ken pom and RPI is 49. This is a one-bid conference and the only hope for the Zips (or OU) is to win at the Q. Second, I think it was time for the Bracket Buster to go away. The idea was noble, but I don't really think it ended up going anywhere. It certainly didn't do much for the bracket--though you could argue the Bracket Buster win VCU got over Wichita State that season got them an at-large bid and they ended up in the Final Four. The biggest potential plus it had was some badly needed schedule variety. BG had 12 opponents, and two were Youngstown State and one was Detroit. Another was Wright State...all teams we play or could play regularly. IPFW is nothing too exciting and we played Morehead State twice. The UIC thing was good, Valpo was good, Canisius was a new opponent and sounds like a sneeze, and Arkansas Little Rock is at least far away. In almost classic BG fashion, the Falcons finished 6-6 in the bracket buster. I have long thought that the MAC should find a comparable conference and play a set of games on the same weekend. Of course, you'd have to find a conference with 12 teams, etc. It was not a great night for the Falcons in Fort Wayne. In short, you had a team light the Falcons up for an incredible shooting night, you had your star power forward benched for the second half and then you had your normally implacable coach outwardly frustrated when he was interviewed after the game. Two of those things don't have to be bad, but for last night, all was not well in the land. IPFW shot 60% from the field and 67% from beyond the arc. That totals out to a 71.2% effective field goal percent (give 1.5x credit for 3s) which is the worst for BG this year. The next worse, in some kind of cruel irony, was IUPUI. It is the worst FG% defensive performance for BG since the GW game last year. It was the 90th worst FG% defensive performance in D1 this year, and that doesn't sound like much, but you might want to think about how many games have been played by the 345 teams in D1 and you get an idea where that stands. Coach had a very direct explanation. "We didn't guard." He was asked whether it was a case of IPFW just being hot, and he said, yeah, you gotta make a shot, even a wide open one, but on defense "you have to make people miss." And, obviously there was not much of that going on. He was agitated. Short clipped sentences, clear passion in his voice. I know a lot of fans think he is too placid. I believe that is an exterior view. I think he's a pretty tough competitor. He might not be having the success anyone (including him) wants to see, but I don't think he's placid or passive. To wit: the other news from last night was that he sat A'uston Calhoun for the entire second half. Coach Hopson was asked about it on the radio, and he said that BG had identified on film that the guy guarding Calhoun couldn't guard on the perimeter, and therefore the game plan was for us to attack him by going to the basket. You don't have to feed Calhoun in the post, you can get him the ball in space...it makes sense. Instead, Calhoun settled for jumpers and didn't play in the second half. BG went very young in the second half, and things were a lot better. Granted, the game was not close, but BG scored 49 points in the second half without Calhoun seeing one second of play. They played inside out, got shots, made shots, etc. As far as the game flow, it just wasn't really close for very long. It was 9-6 with 14:19 left, but three minutes later IPFW was up 13 and then with 5 minutes left in the half they were up 22. It was 17 at the half, back up in the 20s in the early second, and then BG poked it 9 but no closer in the final minutes. There were a couple of moments where BG had a shot down 9 to cut the lead a little closer, but they didn't get the hoops they needed. As Todd Walker pointed out, there is almost no margin for error at that point. Statistically, it was a fast game, with 74 possessions. IPFW scored 1.19 points per possession, which is a losing proposition for our team, which has only won once over .93 points per possession. BG had a good offensive game by its measure, with 1.01 points per possession and with a solid defensive effort scored plenty well enough to win. BG made too many turnovers--but so did IPFW--and BG had a good night on the offensive boards and IPFW got a lot of free throw attempts but did a lousy job making them. Shooting is the one stat that decided the game. Individually, BG got a good second half out of Jordon Crawford (10 points, 4 of 7 shooting), Chauncey Orr (10 points, 4 of 5 shooting), Spencer Parker (9 points on 3 of 6 shooting to go with 5 rebounds) and Richaun Holmes (8 points on 4 of 5 shooting). Frank Gaines, who became IPFW's leading career scorer during the game, torched BG for 26. So, what happens next? BG still can get a bye in the MAC tourney, salvaging at least something out of a disappointing season. The question is what the reaction to all the discomfort last night will be. Will it be to come out in a must-win game against Miami and give a strong performance? Or, will the frustrations mount? BG is 11-16 and 9-16 in D1. American Mastodon on Right. Extinct. When Thomas Jefferson met with Lewis and Clark before sending them on their expedition, he had no idea what they were going to find. He had ideas though...in fact, one of the things that Jefferson thought they would see were mastodons. In fact, Jefferson had a mastodon fossil at Monticello which had been found in Kentucky, which is why he thought they might be roaming the wild west. Anyway, President Jefferson was only off by 11,000 years, which is when wikipedia says that the Mastodon became extinct. This is all relevant because BG is in Fort Wayne, Indiana, the fictional home of Frank Burns (or, maybe, the home of the fictional Frank Burns), to play the IPFW Mastodons. This is the final bracket buster game ever, and someday in the next couple of seasons IPFW will head over to the Stroh Center and finish the deal. When we found out we were playing IPFW I recalled the day's events, which included an epic Dan Dakich meltdown, a MAC reprimand and a bunch of little kids chanting a reminder to coach on what to do after games. We haven't played them since. IPFW plays in the Summit League where they are in sole possession of 6th place. It isn't a bad conference...North Dakota State played Akron in the bracket buster last night and they're in 3rd place. In fact, based on RPI, the Summit League is the #16 league and the MAC is #17. IPFW is not having a great season. They are 13-16, which is not bad. Two of those wins were against non-D1 competition and 10 of them were against teams with RPI over 200. Their marquee win was against Oakland, the team that ended our season last year. This isn't a great Oakland team but it was a nice win--in Ft. Wayne--for the Mastodons. They have won 3 in a row entering Saturday's contest. Their RPI is 289 and their strength of schedule is 322, which makes it one of the 50 weakest in D1. Their kenpom is 256. They lost by only 11 to Valpo and 12 to Notre Dame, and kenpom gives you credit for that kind of thing. They play their games at 66 possessions per, which is about where BG plays. They are not a great offensive team. They score .99 points per possession, which is below average, though not awful. They are a pretty decent team, shooting 48.5% on effective FG%, which is almost right on the NCAA median. They are pretty decent on the offensive boards at 32.7%, (146th) and turn the ball over on 20% of their possessions, which is 149th. They do get to the line....they are 95th in the nation in free throw rate but they are an awful FT shooting team (64.6%). They shoot 34% on 3FG and 29% of their points on 3s, both of which are slightly above average but not incredible numbers. On defense, they allow .98 points per possession, which is slightly above average, though not dominant by any means. They don't defend the shot well...they allow 50.8% effective FG% which is 279th. They are, however, excellent on the offensive boards, allowing their opponents only 25% of the available missed shots, which is #7 in the country. Their turnover percentage (20.7%) is about average and teams do get to the line against them, though not as often as IPFW gets to the line. IPFW does feature a marquee player, and that is Frank Gaines. The 6'3" Senior guard is averaging 19.2 PPG this year, which is 22nd in the country. He was first-team all-conference last year Last year, he averaged 21 PPG. He takes 31% of their shots and is relatively efficient for a big scorer...he shoots 42% from the field and 34% from 3 and his offensive rating is 104. He also has 4 rebounds per game and (not surprisingly) about 1 assist. 6'5" JR Luis Jacobo also scores in double figures at 10 points per game and is their best 3-FG shooter. Mario Hines (6'8") is their top rebounder with 5.7 rebounds per game and their leading assist man has only 2.7 per game (Pierre Bland). This is not a bad team at all. They play in a decent conference and have decent numbers in that conference. Having said that, this is also not a good team. They've lost 4 times at home. Of course, BG still has just the 1 road win with 2 road games left on the schedule, including today. BG has been playing better than they were early in the year. It isn't an enormous jump, but they are better. The other road game left is Kent, who is having a down year, and a win @Kent would be huge for BG. A road win tonight might help to get BG on that track. BG played a team that was completely outmatched last night at the Stroh Center. And, for the first time this year, BG actually followed through and made an outmatched team look outmatched. After struggling with Central State in an exhibition and then Lake Erie in the season opener, BG blew New Orleans out tonight by 31 after leading by as much as 39. I will say this...the Privateers played a classy game. They showed respect for themselves...they weren't chippy and they weren't just jacking shots up. They played hard...their coach even mopped the floor up. This is a really tough situation to be in for them, and it can't be easy to keep going through this. Five minutes in UNO was holding its own and was only down 12-8. By the time there was 11:33 left, BG had the lead extended to 20-10. BG was up 12 with about 3 minutes left and then hit a couple layups in the last minutes to lead by 17 at halftime. BG came out of the locker room on a 17-4 run that spanned just over 4 minutes and at that point the route was on. First of all, it was a pretty uptempo game with 72 possessions. The only games BG has played with more possessions had overtimes. Even with that, BG scored 1.21 points per possession, which was their best offensive game of the season. (Next best was Huntsville). BG had only 8 turnovers in an uptemo game (11% of possessions, a season best) and shot over 52% on Effective FG%. That's 46% for all FG and 45% from 3FG. BG also got 41% of the available offensive rebounds (3rd best this season), and when you have a situation where you don't turn the ball over and you make shots and when you don't you get the rebound 2 times out of 5 you are going to score some points. BG also dominated on the other side. UNO scored only .78 points per possession, which is the 4th best of the season. The stats sort of become repetitive...they are exactly what you would expect for a game that was this one-sided. Individually, BG was able to get a lot of guys in. No one played more than 25 minutes. Crawford ended up with 16 on 7 of 11 shooting. Calhoun had 16 on 5 of 11 shooting and 6 rebounds. Chauncey Orr had 12, Black 8 with 8 boards, Holmes 9 with 10 rebounds. BG is now 11-15 and 9-15 in D1 games. They play the Mastadons of IPFW on Saturday in the Bracket Buster and then rejoin the MAC race, which as we covered yesterday, still has potential for the Falcons. They will leap right into a game they absolutely must have, which is Miami at the Stroh. Anyway, the take away from the New Orleans game is that BG had a game where they were clearly better and it looked like it. So, now we are on the same page. OU and EMU played their 12th game last night and now everyone in the conference is on even footing. OU smoked EMU by 23 at the Convo and that leaves what you see here. If the season ended today, the Falcons would get a bye directly to the Q and would not play a first round game. This position is strengthened by the fact that we are on the only east team that is done with Akron. Furthermore, BG is only one game behind Buffalo for a quarterfinal bye and still plays Buffalo at BG. Buffalo has a really tough road home. They play @Kent and then they have Akron and OU--in Buffalo, yes, but still--and then @BG, who plays well at home. Honestly, Buffalo could easily go 0-4 and 1-3 is probably likely. Kent still plays BG and Buffalo at Kent, and @Miami. I think Kent could easily go 3-1. Eastern is a slightly different story because they will only play teams from the West from here on in. And, they have their more difficult games (WMU, UT) at home and their easier games on the road. They could also go 3-1, though I guess I think 2-2 is more likely. Ball State is one game back from that pack. They have the opposite situation--they play @WMU and @UT and have the easily game at home. They are a good target to finish 6-10. If that plays out...Kent at 8-8, Buffalo and EMU at 7-9 and BSU at 6-10, BG would have to win 3 coming home to finish #4. That would mean beating Miami and Buffalo at the Stroh and then either winning against OU or @Kent. Assuming you get there beating OU and BG and Kent tie, BG would win the tiebreaker so long as Kent did not beat Akron. In other words, if BG wins 3 coming home, there is a very good chance that they will end up in 4th. It isn't impossible BG beats OU at home. BG is a much different team on our floor. However, if you want likely scenarios, I think it is that BG goes 2-2 coming home. That would leave BG 7-9 and tied with Buffalo and EMU. In that hot three-way action, BG would be 2-1 and EMU 1-1 and Buffalo 1-2 and that's how it would play out. BG would get the bye to the Q. If you want to look at home court, BG has a 2 game lead on NIU and Miami. They have the tiebreaker over NIU and currently not over Miami, but if they were to beat Miami then the WMU win would give BG the tiebreaker and they would get home court. If BG ends up on the road for the first round of the MAC tournament, that will be very disappointing. There's plenty to watch for. It is dramatic, if not pretty. The MAC is top heavy this year. We have two really good teams at the top--better than normal--and then the middle is softer. The bottom, probably, is less soft than before...there's no 4-26 team down there--but from #2 (or #3) down, the MAC is not at strong as it normally is. The losses BG had @CMU and @Miami really hurt. You get one of those games back, and you're in a completely different situation. In any event, it is certainly very plausible at this point that BG could finish #5 in the MAC (important note, these rankings are tournament rankings that exclude Toledo, so BG would actually be #6 in the MAC) and I actually think that would be a moderate case of exceeding expectations. The Falcons have a two-game break from MAC play this week and the first game is at home against the New Orleans Privateers. You want to see a team that is in a tough spot, you might look at these Privateers, whose athletic program has been the center of the most chaos I can ever remember seeing. In the beginning: UNO was a charter member of the Sun Belt. December 2009: due to Katrina-driven enrollment losses, UNO decided to move its athletic program from Division I to Division III. June 2010: Approved by NCAA Division III Membership Committee. They were supposedly adding football, along with women's golf and women's soccer. June 30, 2010: UNO left the Sun Belt and competed as an NCAA Division I Independent during the 2010-11 academic year as part of the transition away from Division I. Then, they decided to compete in Division II starting in 11-12 and join the Gulf Coast Conference in 12-13. March 2012: They decided to stay Division I after all and join the Southland Conference next season and play as an independent this season. Anyway, they are playing as an independent this year, and that is a really hard road. You get no actual games guaranteed and have to pull together a schedule mostly of games like coming to Bowling Green in the middle of February on a Thursday night. It is very difficult to get players when you are sub-Southland. It shows. There's no nice way to put this. New Orleans is 8-14, but based on RPI they are the #346 team in the country. The only worse team is 0-23 Grambling. They are also ranked #346 on kenpom. You might say, hey, 8-14 doesn't sound so bad. One of those wins was over Blue Mountain (an NAIA team), one was over and Central Baptist (also NAIA) and two of them were over Champion Baptist, a member of the Association of Christian College Athletics--they sponsor two varsity sports and schedule JUCO teams. Their marquee win was over San Jose State in New Orleans. San Jose has an RPI of #242 and fired their coach. They also lost @San Jose State--in fact, they have played a couple home and homes IN THE SAME SEASON this year. They are winless on the road. They did stay within 13 of Butler. The first thing is these guys play fast. Very fast. They are averaging 75 possessions per game which is #2 in all of D1. (The other thing to keep in mind is that their stats include 3 NAIA games and one sub-NAIA game). They aren't very good at it, but they do play fast. They average only .95 points per possession. They don't like to shoot the 3. They are 3rd from the bottom in D1 in 3 attempts and 3 made. There's a good reason why they don't like to shoot them....the only make 15%, also among the 3 worst in the nation. So, they get the .95 points on field goals and free throws, and they aren't a great free throw shooting team. I would assume, therefore, that we will see them attack the rim. They turn the ball over a lot--even given their high number of possessions. In fact, only 22 teams have turned the ball over on a higher percentage of possessions. They are about at the NCAA average for offensive rebounding percentage. They are not a terrible defensive team, allowing 1 point per possession. That's largely built on turnovers--they force turnovers on 23% of their defensive possessions which is in the top 50 in the country. (I am assuming we will see Havoc-style pressure from them). If you do get a shot off, they allow an effective FG% of 51% (not good) and don't defend the offensive rebound especially well. For a pressure team they don't foul too much. They have one double figure scorer....6'6" Sr. Lovell Cook. Lovell started his career at Gillette College, went to Northern-Oklahoma Enid and then found his way to UNO. He is scoring about 15 a game this year on 56% shooting. Rarlensee Nelson is their second leading scorer at 9.7 PPG with 7 assists per game. He's a senior who played JUCO and will provide some comfort to Jordon Crawford. Nelson is 5'8". Cory Dixon (6'7") is their leading rebounder. Also a JUCO player. In fact, their website shows that of the 17 players on their roster, 10 of them transferred from another school. And they have one guy from Anchorage. So, the Privateers are among the worst teams in college basketball. You just gotta win this game. They do play a different style which can be difficult to deal with when you don't see it. You just don't want to see an L show up against these guys on your own floor. I wouldn't be me if I didn't point out that UNO has 4 NCAA appearences since 1987, which stands in contrast to BG's 0 since 1968. They were a #7 seed in '87 and won a game and then put a scare into Kansas in 1991. They were a #8 in 1993 and last made the 1996 tournament. Something I noticed when looking at the MAC stats....it is well known that BG is heavily reliant on two of its seniors--A'uston Calhoun and Jordon Crawford. I guess I didn't realize how much until I saw that those two guys are 1-2 in the MAC in minutes played. Calhoun is #1 with 35.2 minutes per game and Crawford is just slightly behind at 35.1. They have a decent sized lead over the next spot, which is a couple of UT guys at 33 minutes per game. Not surprisingly, they are #5 and #6 in scoring, partly due to the minutes. Calhoun is also 5th in rebounding and Crawford 5th in assists and 6th in steals. BG Sophomore Richaun Holmes set the program record for most blocked shots in a season on Saturday when he blocked his second shot--#60--and then went on to block 2 more. It is pretty impressive, for a couple of reasons. First, the existing record was set by Cornelius Cash, a Falcon of my youth. He blocked 59 in 1974, which means Holmes is breaking a record that stood for 39 seasons. If you notice a contemporary bent to the stats, I don't think that blocked shots were kept from the beginning of basketball. The NCAA did make them an official stat until the mid 1980s. Anyway, you can see a bunch of shot blockers and Holmes has passed them all and has time left to get more. The other thing that makes this impressive is that Holmes doesn't play that much. He is averaging only 19 minutes a game, probably less than any of the guys on that list you see above me. According to statsheet.com, he blocks 14.3% of the shots taken while he is in the game (this is a statistical estimate), which is #5 in D1 this year and #1 in the MAC. Here is his block% by game. As you can see, there have been some games with no blocks recently. It seems--and this is only an observation--that teams are giving him a shot fake more, but that might be my imagination. Certainly, when you block shots like this, teams are going to adjust and he just has to adjust back. He's also the 5th most efficient scorer in the MAC, which means he might not score a ton but he does it without using a ton possessions as well. He had a big game Saturday in Akron and I have high hopes for his ability to contribute in this conference, especially if he gets a little bigger and stronger on the inside. The Akron Zips finished up their two-game sweep of Bowling Green last night at the JAR with a 17 point victory that is not as close as the game actually was. Not that it was close, but it wasn't a 17 point game. In fact, BG had a chance to get back late, as unlikely as that might have seemed early. In fact, the Falcons went down 9-0 and did not score for the first 6:10 of the game. BG pushed it back to 3 with about 9 minutes left, but then Akron took control again, leading by as much as 11 and then ended up being +8 at the half when Luke Kraus hit a late three. The Falcons talked about how they "retreated" during the game at the Stroh. In this case, you can't say that. BG was down 11 got back to 6 and then went down 12 and got it back to 6 with 5:31 left. At this point, the game's key sequence occurred. BG got a series of 3 stops and had 4 chances with the ball to cut the lead inside 6, but Crawford missed twice, Calhoun missed once and Kraus turned the ball over once and then Akron finally scored to go up 8 and from there the Zips went 10-1 to wrap up the game. So, for a short period of time we had the game close and got the stops we needed and couldn't score to take advantage. The problem is that when you play a team that is better than you, you have almost no margin for error, and our margin was about four possessions. BG had .76 points per possession, their worst offensive game of the season. BG only shot 24% in the first half on their way to 32.8% for the game. BG was also 3-12 from beyond the arc. The Zips didn't shoot a lot better, but were +7 on turnovers and +10 on free throws and got 41% of their offensive rebounds, and that was enough for them to get the victory. If you turn the ball over on 23% of your possessions and then when you do get a shot off you only make it 33% of the time, you are going to have trouble winning that game. You're going to need exemplary defense, and BG only got slightly below average defense (for the game, Akron had 1.02 points per possession, which is well below their average for the season but well above where BG typically needs to be to win) and that's just how Team A beats Team B. Individually, BG had a great game from Richaun Holmes, who had 15 points on 5 of 6 shooting and 5 of 5 FTS to go with 8 rebounds and 4 blocks in 28 minutes. Calhoun had 11 on 5 of 10 shooting, though for the second straight game he was held off the boards. However, BG's guards were 7 of 30 from the field, including a mind-boggling 3 of 17 from Jordon Crawford. Orr and Black were also a combined 2 for 10. In other words, beyond Holmes and Calhoun, the shooting woes were widespread. Kraus did have 3 treys and Crawford had 5 assists over 3 turnovers. Sealey played 11 scoreless minutes and Anthony Henderson made it in the game for 3 minutes. BG falls to 10-15 overall and 5-7 in the MAC. For all that, if OU beats EMU Wednesday in Athens, as expected, BG will be in the 5th slot and the lead for the last bye spot into the MAC tourney. Also, BG plays 3 of the last 4 at home. BG is only 1 game behind Buffalo, who has to play Akron and OU (admittedly both at home) and then comes to BG to finish the season. So, as imperfect as it has been, there are still things to keep us interested. Beyond EMU-OU make up game, this is an off-week in MAC play. No other conference games until a week from Wednesday. Of course, the bracket busters are up next weekend, and BGSU has New Orleans coming in on Thursday, but the MAC play gets a little breather before racing down the home stretch. So BG heads over to the JAR tomorrow for its first rematch of the season, this one against the University of Akron Zips. Akron leads the MAC and is undefeated in conference play heading into the game. I'm not going to recap the preview I did last time, because not much has changed. You can go back and check it out. Akron is a very, very good team that has now beaten BG in 16 out of the last 17 games played between the two teams. Coming into the game at the Stroh, the Zips had won 11 straight overall and since the BG game they have beaten OU, CMU, @Miami and @EMU to make it a 16 game winning streak. They have an RPI of 53 and a kenpom of 54. There has been talk of whether they could get an at-large bid if the don't win at the Q, but at this point, there are not mentioned as being on anyone's bubble. Perhaps a win in the Bracket Buster (North Dakota State at the JAR) will help their number, though they would have been better off getting a road assignment. They are 12-0 at home this year and 39-4 over the past 3 seasons. If you recall, the first game between the two teams resulted in a 13 point Zip win at the Stroh. It was a game that prompted some soul searching on the BG sidelines, as the Falcons, in the words of Chauncey Orr, "retreated" in the face of the strong Zip challenge. In that game, Akron had a huge advantage in shooting and that was pretty much the difference in the game. BG even had a big lead in free throws and turnovers were even....Akron just shot the ball a lot better than BG did. In that game, Zeke Marshall scored 15 points to lead the Zips. Treadwell and Harney both had 10. (Remember, no one plays big minutes for Akron, so no one racks up big numbers). For BG, Chauncey Orr had 16 and Calhoun had an 11/11 double-double but shot 2 of 13 from the field. Dambrot said something after the game like, if you can stop Calhoun and Crawford, you have stopped BG. The Falcons will definitely need to get more people involved because Akron was determined not to give any chances to Calhoun inside. It might help to move him out to mid-range, as BG did against WMU. For the Falcons to pull off the improbable win at the JAR on Saturday, it isn't actually too complicated. They are going to have to play their absolute best game on both ends of the floor, get contributions out of a lot of guys and get a couple breaks. Akron is #2 in the MAC in scoring and scoring defense...they are deep and they are tough to beat. On the other hand, someone loses a game like this every night and why shouldn't it be this one? BG needed a win Wednesday. Say what you will, and you're not entirely wrong, but this team has a shot to get at one of the byes in the conference tournament. And, if you're going to play for that, you need to beat a team like WMU on your own floor. Which BG did last night by 10 points in a very physical basketball game. I really felt like BG was playing with urgency and intensity from the very beginning. BG was up 7 early in the half, Western battled back to take a late lead and the teams went into the locker room tied at 30--the 5th tie of the first half. Man, the Broncos are a physical team. I have read how they practice with tackling dummies and the football team. It is amazing. For example, Connor Tava, whose natural position is bouncer, fouled out in 18 minutes of low-level felony basketball. They were physical in the first half and I think they came out determined to be more physical in the second half. The difference was, based on the comments of the coaches after the game, was that BG decided in the locker room that they weren't going to get pushed around anymore. You had to decide--are you going to match it, or not. BG was out-rebounded 24-11 in the first half. WMU got 53% of their missed shots. Without that, the game is not tied. In the second half, BG out rebounded WMU 17-14. WMU only got 40% of its missed shots (which is still too high) but BG got 46% of its missed shots as well. It was a huge turnaround. Speaking of missed shots, the most important thing in the game was that BG didn't have that many in the second half. BG shot 64.5% for the second half and 3 of 7 from beyond the arc. Riding that kind of shooting and improved boardwork, BG had an 8 point lead going into the first media timeout...a big shift from BG's less productive games. WMU is a tough team and they drove the lead back to 2, but BG went on a 16-3 run over 8 minutes of play, a streak of stops that featured 6 WMU turnovers and no WMU FGs. It was as good a period of man-man defense as I have seen this team play in a long time, and it put the game away. WMU got the game down to 6 inside of a minute left, but BG nailed its free throws and WMU never had the chance to tie the game. A'uston Calhoun just had a huge game. He scored 24 points on 10 of 17 shooting. He was 2-3 from beyond the arc, and he made some really tough jumpers under pressure when nothing was going offensively. He was had his mid-range game going, and he's tough to guard in that kind of a setting, even for a team with a bunch of big guys. Jordon Crawford had an interesting night, in that WMU put 6'7" Nate Hutcheson on him. It impacted him...he had 6 turnovers to go with 13 points and 4 assists. He shot 4 of 10 but 2 of 4 from beyond the arc. I thought BG adjusted well, and even with the strong pressure on Crawford (in addition to Hutcheson they often ran a second guy at him) we were able to get shots. I though having Kraus out there in this situation really helped to have a guy you could get the ball to. Crawford also played really tenacious defense, and though he did not end up with any steals, he was disruptive. Chauncey Orr had 11 points, not shooting very well (2-5) but making all 7 of his free throws. Luke Kraus contributed 9 points on 3-6 shooting and Richaun Holmes had 9 points and 8 rebounds in 26 minutes. Jehvon Clarke also had 5 points in 9 minutes. Statistically, the game was right were BG needs it to be. There were 65 possessions. The Falcons had 1.07 points per possession and allowed only .92 points per possession, which is right where the Falcons typically need to hold an opponent to win. The key difference was shooting. As you can see below, BG had a strong advantage on EFG%, including making 46% of 3FG's. WMU had a huge advantage on rebounding and both teams had a rough night taking care of the ball. The other keys statistic was free throws. As we noted in our preview, WMU had had huge free throw advantages over its opponents this year. Here, they only got to the line a little more than BG and the Falcons ended the game with a +3 advantage on made free throws. Probably the single biggest failing in WMU's game was free throw shooting...they made only 50%, failing to take advantage of the number of times they got to the line. It is tough to win that way, because you use up possessions and don't get points. If the season ended today, BG would be in 4th in the MAC and have a bye into the quarter finals of the MAC tournament. The season isn't ending today, but BG certainly has something to play for. We have a couple winnable home games...there's something to watch and that makes the season interesting. The Falcons picked up a very nice win tonight against WMU. They continue to play well at the Stroh Center most of the time, and played a very solid against a very, very physical Bronco team. We got contributions up and down the bench, made some shots, played some very strong defense at times and in the end had a comfortable win. It was an enjoyable game to watch (as wins normally are). More tomorrow. One thing, though. For all the issues with this season, BG certainly has a shot a a bye....there's a long way to go, but if BG were to beat Miami and Buffalo at home they'd be in decent shape and if they were to pull off the upset over OU at the Stroh they'd be in even better shape. If the tournament started today, BG would have a bye directly to the quarterfinals. (Tiebreakers below sorted out based on Jeremy Guy's twitter feed). Anyway, time will tell, but this is a very achievable goal. One thing to look out for. The MAC did not do the East-West-East rotation...the games are more mixed. However, the games from here on in (with the exception of the OU/EMU postponement) will be inside the division. So, as you look at the standings, keep in mind that the teams in the West could have a slightly easier road coming home. Note that BG owns tiebreakers over EMU, Ball, and NIU and play Miami, Kent and Buffalo coming home. So here are the first permutations for the men's hoops season. Thankful for a low bar, I think that any team finishing strong can still earn as high as a #4. We have eliminated UT, since they are not eligible for post-season play. EMU's extra game is @OU, so they are more or less tied with the other teams at 4-6. 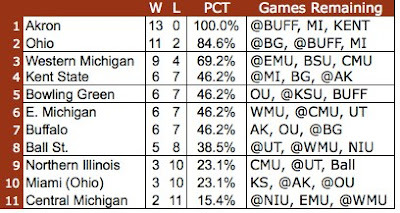 Also, if BG beats WMU, they are looking pretty good for at least a home berth. With the win, they have a decent shot at 7 wins, which all the 3-7 teams would be hard pressed to reach. Obviously, there' s along way to go. Only point is, I think BG's schedule is slightly favorable coming home and, amazing as it might seen, there is plenty to play for in the middle of the conference, where no one has broken out yet. It has been a tale of 3 seasons for WMU. They started off 6-1, then went 2-6 in the tough part of their schedule (including opening the MAC @Akron and OU) and then ripped off 7 in a row before losing @Ball State Saturday. They are 15-8 and 7-3 in the MAC, with an RPI of 101 and a kenpom.com of 122. They won @South Florida (which BG did not) and beat Oakland. They lost to some good teams...@Michigan, @Illinois State, @NC State, @Akron and at home to OU. Really, their worst losses are @Cornell, @Duquesne and @Ball State, and those were all road games. They won @CMU (by 17), which BG did not and they beat Toledo and won @Miami. In today's division agnostic MAC, they are tied for 3rd with UT, who is not eligible for the post-season. They have to figure they have a very good shot at a quarter final bye. Last year was a down year for the Broncos, as they went 14-20. It was only their third losing season in the last 13 years. They have already surpassed last year's win total. BG clubbed them by 24 last year in K-zoo, but it was only the Falcon's second win against them in the last 15 games. The Broncos are always big and physical and this year's team is no exception. They are led this year by a true late bloomer, Shayne Whittington, a 6'10" JR who had never played more than 14 minutes a game and had averaged a 4/4 single-single last year. This year, he leads the team in scoring (12.6 ppg in 27 minutes) and rebounding (8.4 per game, which is 2nd in the MAC). He is 9th in offensive rating...he has turned into a really good player really fast. Nate Hutcheson (6'7" SR) is scoring 11.2 PPG and about 5 rpg). He's been a solid player for some time, but they are also getting 11 points a game (in 21 minutes) from a guy named David Brown who returned for the MAC season after an ACL tear last season and 11 points and 6 rebounds from 6'8" FR Darius Paul. Paul is the clubhouse leader for FR of the Year in the MAC. His brother plays for Illinois. Their PG, Austin Richie, gets 3 assists per game. This is a very strong, big, physical team and that will be challenge #1 for BG. Witness the fact that they are #1 in the MAC and #3 in the nation in getting to the free throw line and they are #1 in overall rebounding. Only 3 D1 teams get a higher percentage of their points from free throws. Overall, they are #5 in the MAC in offensive efficiency at 1.02 points per possession. They are only #6 in the MAC in Effective FG% and #5 in turnover %. So, you have a decent if not great offensive team that is very strong on the boards and gets to the line a lot. BG has struggled rebounding this year and they're going to need to really bringing that tomorrow night if they want to compete. BG already is one of the top 40 D1 teams in not fouling, so you'd think that would be good. If you see a bunch of fouls start to be called on BG, run for the hills. They are also strong on defense. They are 4th in the MAC in defensive efficiency at .96 points per game. (BG is 5th). They start by being 3rd in the MAC in defending the shot. Like a lot of very good rebounding team, they don't cause a lot of turnovers (11th in the MAC--all those guys are around the basket) and they are best in the MAC at protecting their defensive boards. Finally, they are 4th in the MAC in keeping teams off the foul line. They are +106 in free throws made this season. Yeesh. This is a very solid team with 3 MAC road wins this year and a string of success against BG. As mentioned, BG will need to play very strong on the inside to compete tomorrow. We need to keep WMU off the line to get WMU down to the kind of offensive total where we have a shot and then BG needs to make some shots in order to get in the range where we have enough points to win. Calhoun averaged a double-double on the week, posting 17.0 points and 10.0 rebounds per game as the Falcons split two games on the week. Calhoun had 15 points, 12 rebounds, a block and a steal in the team's win at Northern Illinois, the first Falcon road victory of the season. He then followed that up with a game-high 19 points and eight rebounds at Ohio. Calhoun also went 9-of-11 from the free-throw line on the week. We have heard that Gehrig Dieter, a Parade All-American WR is transferring SMU to BG. He is bringing a couple of guys with him. In this case, that includes his older brother, QB Nolan Dieter. Dieter walked on at Indiana in 2011 and then didn't play last year. He is walking on at BG. He had some big HS numbers which you can check out in The Blade story. Also, Eric Woods, a RB and HS teammate of the Dieter boys will be coming to BG as a walk-on. He was also apparently a walk on at IU. Anyway, just a little info for the off-season. One of the things about basketball is the "spurt." Many times, it is a game of competing spurts--one team has one and then the other team has one back. Last night's BG-OU game was decided by one spurt....one 5 minute spurt where OU blew a close game wide open and then held the ground for the remainder of the game. To make up a deficit, you have to have more good possessions--on both ends--than the opponent. BG was good enough to stay even, but never good enough to consistently get those advantages in the second half. Here is how it happened. BG played a really good first half, never leading but fighting back from being 7 down and getting a late follow by Craig Sealey to head into the locker room down 1. Then, the first 5:00 of the 2nd half were a complete disaster for BG. OU outscored the Falcons 13-3 over that period. BG seemed to shoot a lot of 3s in that period and had a couple of turnovers, both of which are things that this team doesn't seem to do when it is going well. Anyway, the next 15 minutes were just what the first 20 were--even--but the advantage gained in those five minutes was enough. BG got the lead down to 6 once but never closer, and OU did pump the lead to 16 at one point, but OU won the game on that early second half spurt. The end of the game got a little "chippy" as we used to say in hockey. It appeared to be Crawford and Cooper chipping, and they both got T'd up and then La'Monta Stone and an OU assistant were getting verbilie on each other and they got T'd up, none of which meant anything. Then, in the handshake line the Stone and the OU coach had some words and then there was a little pushing from the players but it all got cleared out before anything serious happened. After the game, Coach Orr said that it is an emotional game and that will happen sometimes. And Coach Stone said he was backing up his player and would do it again if it was needed. Back to the game, OU was held below their season offensive efficiency of 1.08--they scored 1.04. Unfortunately, that's not really a zone where BG has had very little success winning. BG scored .91 points per possession, which is also below its season average. OU had a small advantage shooting, but a big advantage in turnovers and a +6 advantage at the free throw line was enough for the Bobcats to get the win. BG had a pretty good game on the boards, but it was not enough to turn it around. OU came in as the best 3-shooting team in the MAC, but the Falcons did a really nice job on that. OU was only 6-23 from beyond the arc. Individually, BG had 19 points from Calhoun and 17 from Crawford. Calhoun shot 7 of 16 and 7 of 13 on 2FG and Crawford was 6 of 14, both of which are OK but not great shooting nights. Calhoun added 8 rebounds and Crawford had 4 assists and 4 turnovers with no steals. From the bench, Craig Sealey had a pretty interesting line. He had 8 points (4-5 shooting) and 12 rebounds in 16 minutes played. Seriously. Orr had 7 on 3 of 6 shooting and Holmes had 8 points on 3-5 shooting in only 18 minutes. Cam Black had 6 rebounds in only 14 minutes. BG had four players go more than 30 minutes--Calhoun, Crawford, Kraus (0 for 6 shooting) and Orr. No one else played more than 18 minutes. Anthony Henderson went from starting to playing 4 minutes. OU had 10,846 in the house for that one. Love their hoops down there. BG is now 9-14 and 7-14 against D1 competition. BG is now 4-6 in the MAC, with WMU coming to town on Wednesday and then a game @Akron. This is a very tough period for our team, and I will say this. A win Wednesday against OU would go a long way toward a respectable MAC season for this team. There has been a lot of controversy on campus about spending, and we're not wading into that. I read a comment about BG's "failed" bowl game, and I decided to look around and see what I could find about it. What I did find was pretty interesting....let's say, the other side of the MAC's 7 bowl teams in 2012. The Columbus Dispatch looked at bowl finances within the MAC. It is pretty sobering. I think a lot of people view bowl games as a money-making effort for the schools. ln fact, as the Commissioner says in the story, your real hope is just to break even. You can start with NIU in the Orange Bowl, the one game where you would think you were assured of a big payday. There are a number of contractually required expenses that increase costs, as below. The Orange Bowl contract requires Northern Illinois to cover $2.4 million in ticket costs and gives the school a $500,000 hotel obligation. Its team must stay at a designated hotel for seven days, and the band is contractually obligated to a minimum three-day stay. The article mentions similar issues at other bowl games, as well. For example, the bowl might have a contract with a certain bus company which a team is required to use, even at a higher cost. In fact, Virginia Tech lost $400K on the 2011 and was bailed out by the ACC and UConn lost $1.2M on the Fiesta Bowl, and they didn't get bailed out. Steinbrecher got the Presidents of the MAC to agree to subsidize NIU to the tune of $4M to ensure they were little not bankrupted by their prosperity. The news for Falcons fans is that the conference also was paid $400K to cover bowl losses. Other MAC schools were also subsidized. Here's a quote from a BG official. “It assures teams that we’re not going to take a (financial) bath. It’s not a red-ink budget to go to a bowl,” said Jim Elsasser, associate athletic director for internal affairs at Bowling Green. This is not the picture you get when you think of bowl games. I wrote that when Kirk Herbstreit said it was a joke that NIU was in the Orange Bowl that the bowl system is a joke, but not because of NIU. These games are essentially television programs. ESPN needs programming and they offer the teams what they dearly want, which is television exposure. I guess what fans need to understand is that the teams are more or less paying for --or buying--that exposure, either directly or through their conference. The fans are certainly realizing what is going on. The USA Today reported that bowl attendance has been going down every year since 2008-09. Even larger schools like Florida are having a hard time selling their allotment...both because of cheap online tickets and because of a kind of fatigue...your team is in a bowl every single season and the economy is not what it once was. Looking at BG more specifically, the Washington Business journal reports that the Military Bowl had its lowest attendance in 5 years and drew a 1.3 rating overnight. For ESPN, that rating is better than they would have had for any other weekday program, but it is pretty soft. In fact, the Military Bowl had the smallest in attendance in 7 years for a bowl game, according to al.com. Here's the thing. I just don't think this is sustainable. And I truly wonder whether there is a payoff for a this. The MAC sacrifices a lot for TV exposure--including most weekend games in November--and this just falls onto the list. I understand that we feel strongly that it is good for the program, and that's fine. Just so people understand that it comes at a cost, and if you read through this article (and the USA Today) article, you have to wonder how long football can continue to sustain this many bowl games. So, riding their first back-to-back wins since December, the Falcons now face one of the season's tougher challenges....a trip to Athens to play the OU Bobcats. OU is one of two elite teams in this year's MAC...and, of course, made the Sweet 16 last season, etc. They are 16-6 so far this season, 7-1 in the MAC and 12-1 at the Convo. They beat a good Richmond team by 25 and Oakland by 17. Overall, their schedule has not been especially tough (#213 by RPI with 9 of their wins over teams with an RPI over 200+) and that is why they are #91 in RPI and #64 in Kenpom. Still, this is a good team. It starts with DJ Cooper. Last year, I felt that Cooper was badly overrated and that, in fact, Alex Abreu was a more valuable player. That's mostly because that Cooper's gaudy point totals were coming at a high cost--bushels of missed shots. He has turned that around this year. He is actually scoring slightly less, but he is shooting 43%, as opposed to 35% last year. His 3-% is up a little, but he is trying slightly fewer as well. As a scorer, he's simply much more valuable than last year, with an efficiency of 108.9, up from 103.2. His assists (which fell to 5.7 last year) and up again, at 7.9, which is #1 in the MAC and #4 in D1. He is turning the ball over 3.6 times per game, which is also the most in the MAC. He is also making 2.1 steals per game. He is simply a better and more complete player than he was last year. He's still probably not as great as people think he is, but he's plenty good. He is going by Reggie Keely and Walter Offut, both of whom are scoring 11 points per game. Keely is shooting 65% from the field and is complimented on the inside by Ivo Baltic, who leads the team in rebounding. (Yeah, dude is FINALLY a senior). This is an incredibly experienced team. EVERY player who averages 10 minutes or more a game is a junior or a senior. They are the 3rd most experienced team in D1 basketball. The big change from last year has been that John Groce took college's basketball's most clenched jaw to Champaign-Urbana and OU brought in Jim Christian, a proven MAC coach at Kent. They played the most up tempo game in the MAC....68.5 possessions. They also lead the MAC in 3FGs made and 3FG%--and are #26 and #55 respectively in D1. They are also the best shooting team in the MAC...in terms of FG% and EFG%. So, we can see the first and primary challenge. BG is going to need to bring its best defensive game. We've only won once when allowing more than .93 points per possession and OU has only been held below that four times this season. On a % basis, they are still not good on the offensive boards (11th) but they take care of the ball--they have the 3rd best turnover rate in the MAC. Rounding out the four factors, they don't get to the line that much--just 10th in the MAC. Defensively? They defend like an elite team. They allow only .93 points per possession, #2 in the MAC and #61 in D1. Their defense is built first and foremost on turnovers---they are 3rd in the nation with 26.6% defensive turnovers. They defend the shot pretty well (46%), and lead the MAC in 3-FG defense. They are 11th in allowing FTs and offensive rebounds, but that isn't enough to counteract the foundation of their defense, which is turnovers and missed shots. This is a very good team. Their rankings are suffering due to scheduling and they did lose @Akron but I think on a neutral court that could be a really tough game and OU is capable of another Sweet 16 run this year. They just don't seem to have any major holes. BG simply has to do everything right...we haven't seen that in a while, but who knows, maybe this is the time for it to happen. OU will be heavily favored and rightfully so. The Falcons finally picked up their first road game in DeKalb last night in a game that was, I suspect, fairly painful to watch. No doubt, we're happy for the win, but there were some long dead times in the second half. The Huskies are not a very good team. They have been playing a little better...they beat Kent and they battled Toledo tough. For whatever it might mean, last night's game was never in doubt. BG broke out to an 8-0 lead, took a 13-3 lead 4 minutes into the game and their lead was never in single digits again. BG led by as much as 27 points in the second half...that moment came with about 15:00 left in the game...and then BG scored only 11 points for the remaining 15 minutes of the game. So, it was a win, a road win...but it didn't sound like we played especially well. A little aside. Coach Dakich used to say the following. You always remember three things. The day you got married. The day your kids were born. The order depends on who you beat. NIU shot only 14% in the first half from the field, with 4 made field goals and 15 total points. I'm sure BG played good defense, but we've established that NIU is one of the least productive offensive teams in D1. They are a little up and down lately. Their last four point totals were 34, 74, 25, 67, 64, 41. So, against BG, they were on the down end of the slope. They ended up shooting only 28% for the game and 15% from beyond the arc. They only shot 61% from the line. It was a very slow paced game...there were only 59 possessions which is really low, so you expect the stat numbers to be lower. For example, in that kind of game, NIU's 14 turnovers (and BG's 12) are worse than they might be normally. Anyway, BG shot 43%, which is above their season average. The Falcons had .97 points per possession, which is pretty much right on their season average, while they held NIU to .7 points per possession, the lowest allowed by our team this season. As you can see in the chart below, BG had a huge shooting lead and a small turnover lead. BG did a poor job keeping NIU off the offensive boards and the Huskies did get to the foul line...but the enormous shooting disparity was enough for the Falcons to get the comfortable win. Individually, A'uston Calhoun led BG with 15 points and 12 rebounds. He shot 5 of 13, so it was a struggle to get there. Richaun Holmes had 11 points on 4 of 7 shooting with 5 rebounds and 3 blocks in 20 minutes played--another efficient and productive game for him. No one else was in double figures. Luke Kraus had 9 points on 3 treys (3-5). Orr had 7 on 3 of 5 shooting. Two notes at guard. First, Jordon Crawford came off the bench again...but this time, we did not see the results we saw against Ball State. He shot 1 of 9 from the field, scoring 2 points in 33 minutes. He had 3 assists, 4 steals and 4 turnovers. The other is Anthony Henderson, who played only 11 minutes. I like Henderson and I think he has scoring potential. He seems to be in a little bit of a slump. In the last three games he has played 40 minutes total and tried only 5 shots. Last night he was only 1 of 2. BG moves to 9-13 and 4-5 in the MAC. As of this morning, BG is in 6th place in the MAC and currently occupies the 5th spot (if you remove Toledo) in the standings, which would, if it held, mean a bye directly to the Q. We shouldn't put the cart before the horse...BG's next 3 games are @OU, WMU and @Akron...in other words, games against the 3 best teams in the MAC with 2 on the road, so we will see where things stand after that. Saw this in The Blade. Hunter Maynard, a Falcon D-tackle, has been suspended indefinitely for a violation of team rules. Maynard was in the Falcon two-deep but was injured during fall drills and missed the entire season, which down as a redshirt. Coach Clawson held his presser today for the signing class. It lasted more than 30 minutes, but I watched and here are the highlights as I heard them. Earlier today I posed questions on two things: the unexpectedly large class and the number of players from Florida. As for the class size, we have been noting that it is more than had been expected and also more than it seemed like we had scholarships for. Coach proactively answered that by saying that 2-3 of the BG players may grayshirt. Here is how that works.....they are signed to BG, but they do not enroll until (in this case), January of 2014. The hope is that some of BG's 5-year seniors will graduate mid-year and open scholarships up. Coach says the 2-3 guys have been told about the gray-shirting plan. If there is attrition in the program, they have a shot to come in August. BG added the additional players that created the grey shirt situation because of some attrition, especially at TB, which went from a position of depth to one of need. So, we needed to get some RBs who could help right away, and that forced the overall numbers up and created the greyshirting situation. As for Florida, the answer according to Coach is related. We needed some positions and they need arose late. Most of the midwest players commit early, so the players who were available were in Florida. Also, they are skill players and Florida seems to be where those guys are. He says 2/3 of the class is from the "State of Bowling Green" and the "heart and soul" of our program is from 5-hours around campus, but the "arms and legs can come from anywhere." Beyond all that, it is the first time BG has not had a full class since Coach Clawson got here. He wants us to move to where we have 5th year seniors in the program and says we are getting there. Beyond the immediate need at RB, there was a need for depth at LB, which is why JUCO Paul Senn is in school. We also saw needs coming down the road at S, interior O-line, interior D-line, TE, P....and we moved to fill those spots. A bunch of these guys were team captains, but Coach kind of poo-pooed that, saying that if you have a D1 player on a HS roster, chances are he will be a captain. Anyway, then he showed some film and commented. Here are the bios of the players...in italics are anything I gleaned of use from what coach said. The video will be available at bgsufalcons.com if you want to watch the whole thing. High School: Currently attends Simeon High School ... coached by Dante Calbreath ... team captain ... ranked as a top-40 recruit in the state of Illinois. Tall, rangy and athletic safety. Reminds him of Gabe Martin. High School: Currently attends Avondale High School ... coached by Steve Deutsh ... team captain ... earned first-team all-league and honorable mention all-state as a senior ... ranked as the No. 54 recruit in the state of Michigan by the Detroit News ... selected to participate in the Michigan High School Coaches Association All-Star Game. Physical interior lineman. Finishes blocks and is what we need in the middle of the line. High School: Currently attends St. Thomas Aquinas High School ... coached by Rocco Casullo ... team captain ... three-year starter ... rushed for 3,300 yards and 58 touchdowns in his career ... earned first-team all-county for three consecutive years and is a two-time first-team all-state member ... led his team to a state championship as a sophomore and senior ... team won the national title as a sophomore. Home run hitter. Huge recruit. 3-year starter on national title team. Also state champions. Is the 4th TB from this HS to play for Dave Clawson. High School: Currently attends Findlay High School ... coached by Mark Ritzler ... team captain ... as a senior earned second-team all-state as a defensive back and third-team all-state as a punter ... also earned Academic All-Ohio that same year ... added first-team all-conference and first-team all Northwest Ohio in 2012. Hopes to redshirt his year. Strong leg. Athlete who happens to punt. Was considered as a WR recruit. A very good athlete. Prior to BGSU: Played in 10 games, making three starts at Southern Methodist University ... caught 10 passes for 168 yards and a touchdown. High School: Was a 2011 graduate of Washington High School ... team captain ... was named a Parade All-American his senior year ... was named Indiana 4A Player of the Year ... holds a national record for receiving yards in a game (437), in a 4A state playoff contest (168) and career touchdown receptions (49) ... was also named first-team All-American by Max Preps ... earned second-team All-American by SI.com and third-team All-American by ESPN. See above. Highly decorated player in Indiana who was FR of Year at SMU. Wants to be closer to home. Top WR on our list last year and is a really good guy for us to pick up. Great ball skills. High School: Currently attends Evans High School ... coached by Chip Gierke ... team captain ... led the district in all-purpose yards and rushing yards, while adding 23 touchdowns as a senior ... participated in the Central Florida All-Star Game. Reminds them of John Pettigrew. Shifty, small but physical. Runs low. High School: Currently attends Forest Hills Central High School ... coached by Tim Rogers ... team captain ... was named to the Grand Rapids Press All-Dream Team ... earned first-team all-conference as a senior. Dad played at UM. Could end up being a 270 lb TE with ball skills. High School: Currently attends Farmington High School ... coached by John Bechtel ... team captain ... earned first-team all-county and all-state as a senior ... ranked as the No. 17 recruit in the state of Michigan by the Detroit News ... was selected to participate in the Michigan High School Coaches Association All-Star Game. Was a UC commit. We picture him as a rangy, athletic high safety. High School: Currently attends Dr. Phillips High School ... coached by Rodney Wells ... team captain ... earned second-team all-state while rushing for over 1,000 yards and 25 touchdowns as a senior ... was selected to participate in the Central Florida All-Star Game. Good hands. Big back. Runs with a good pad level. Good in pass protection and on screens. High School: Currently attends Brush High School ... coached by Josh Wells ... two-time team captain ... four-year starter ... is a three-time all-conference player ... earned at least a 3.0 in all four years at Brush. Great range at LB. Was a successful RB. Can cover sideline to sideline. High School: Currently attends American Heritage High School ... coached by Jeff Dellenbach ... was a 2.5 year starter ... recorded 14 sacks in his junior and senior year combined ... earned all-county as a senior ... participated in the Dade-Broward All-Star Game. Reminds them of Jarius Campbell. Sees him playing over 300 lbs. Hard to find a guy with this range and size. High School: Currently attends Canisius High School ... coached by Rich Robbins ... team captain ... won the Trench Trophy, given to Western New York’s Lineman of the Year ... was named the Buffalo News Player of the Year ... was named Buffalo Bills Alumni Defensive Lineman of the Year ... earned first-team all-state and first-team All-Western New York ... team MVP ... was a two-time Canadian weight lifting champion. Note weight lifting success. Dominating player. High School: Currently attends Pleasant Plains High School ... coached by Brad Pugh ... earned all-conference as a running back his senior year ... that same season was named first-team all-area as a defensive tackle ... earned National Underclassman Tight End MVP Award as a junior. Good ball skills. Smart player who could play right away. TB experience is appreciated. High School: Currently attends Fort Pierce Central High School ... coached by Josh Shaffer ... team captain ... four-year starter ... combined for 1,700 yards and 21 touchdowns as a junior and 1,200 yards and 16 touchdowns as a senior ... earned first-team all-area and all-state in each of the last two years ... competed in the Miami-Dade vs. Florida All-Star Game. Early UC commit. Loved his junior tape. Another bigger back for us, could end up playing at 215 lbs. High School: Currently attends Massillon Jackson High School ... coached by Beau Balderson ... two-time team captain ... earned first-team All-Federal League and second-team all-district ... was also a member of the National Honor Society and a member of the Academic All-Ohio team. Smart, physical, "downhill" LB. Should play Mike. Good straight line speed and could get bigger. High School: Currently attends Lemont High School ... coached by Eric Michaelsen ... two-time team captain ... earned a spot on the 2012 IHSCA all-state class 6A team ... is a three-time South Suburban All-Conference player ... was named All-Area as a senior by the Chicago Tribune, Joliet Herald and Southeastern Star ... helped lead team to three-straight playoff appearances. Tough and physical. Targeted to C.
High School: Currently attends Seminole High School ... coached by Robert Vite ... three-year team captain ... was named the Offensive Player of the Year in Central Florida by the Orlando Touchdown Club ... earned first-team all-state ... was named Most Valuable Player of the Central Florida All-Star Game. Versatile player. Dynamic playmaker. UC Commit. With scholarships available, we had the ability to go for some of the UC guys. High School: Currently attends Seminole Ridge High School ... coached by Matt Dickmann ... team captain ... three-year starter ... earned first-team all-state as a senior and is a two-time all-county first-team selection ... has 16 career interceptions ... competed in the Florida versus Georgia All-Star Game. His coach is from Napoleon, OH. Another long, rangy safety. Played CB in HS. Has CB cover skills but LB hitting skills. Fits great in the 4-2-5, 3 S look we use. High School: Currently attends Michigan Collegiate High School ... coached by Friedo Calderon ... team captain ... earned first-team all-county and first-team all-state as a senior ... named the No. 23 recruit in the state of Michigan by the Detroit News ... selected to participate in the Michigan High School Coaches Association All-Star Game. Big vertical leap, good ball skills. High School: Currently attends Bishop Luers High School ... coached by Steve Keefer ... team captain ... helped lead team to four straight state championships ... had 48 catches for 1,030 yards and 19 touchdowns as a junior, earning first-team all-state ... was a four year starter. Saw him when we recruited Knapke. Playmaker, early commit. Didn't throw as much his senior year. Prior to BGSU: Spent two seasons at Riverside Community College ... coached by Tom Craft ... earned second-team all-conference and was the team’s defensive player of the year ... finished tied for the team lead with 63 tackles. High School: Was a 2010 graduate of Norco High School ... coached by Todd Gerhardt ... earned first-team all-conference as a senior and second-team all-conference his junior season ... was team’s defensive player of the year as a senior. Gives immediate depth at LB. Jhalil Corley was supposed to be a LB but has ended up a DE which has meant that there was a need at LB now. High School: Currently attends Seminole Ridge High School ... coached by Matt Dickmann ... team captain ... two-year starter ... earned first-team all-county and second-team all-state as a senior, recording five sacks and 15 tackles for loss ... played in the Florida versus Georgia All-Star Game. BG needs outside rush help (witness the move of a TE to the edge). Shepherd can be that guy. High School: Currently attends Marist High School ... coached by Pat Dunne ... team captain ... named first-team all-state by the Chicago Tribune as a senior ... same year was named East Suburban Catholic Defensive Player of the Year ... had 81 tackles and 12 sacks in 2012. Reminds Coach of....Chris Jones. Which is a high standard. High School: Currently attends Sylvania Southview High School ... coached by Jim Mayzes ... team captain ... earned all-conference and all-district as a junior and senior ... threw for over 2,000 yards and added another 1,000 yards on the ground his senior year ... led his team to a pair of conference championships. Local guy. Different kind of QB in that he is a dual-threat guy. Strong arm, good athlete. This year's QB.